The Rubik's Cube is the world's best selling toy. 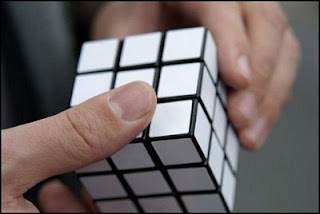 It was invented in the year 1974 by a Hungarian Architect,Erno Rubik. It is also the world's top selling puzzle game.My dad bought me a Rubik's cube when I was a kid and he taught me the technique to solve the puzzle. As a kid, i used to blindly follow the technique and solve the puzzle. But now if someone asks me to solve it, i couldn't because I have forgotten the formula. The movie-Pursuit of happiness has brought tear drops to my eyes many a times. I could totally relate to Will Smith's characterisation in the movie in many scenes. The Rubik's cube plays a vital part in the life of the Hero of the movie,Chris Gardner. If you haven't watched the movie yet, do watch it soon. It is really a soul touching film indeed. Coming back to Rubik's cube, I am writing this post to help all my readers to solve the puzzle. If there are winners, there would be losers. A coin has two sides. For every problem there would be a good solution and there would be a bad solution also. So if you could call my solution for the puzzle as the Good solution, then you should know the person behind the bad solution. He is none other than the rear-end of all jokes Mr. George W Bush. He was once asked to solve the puzzle. "I'm telling you there's an enemy that would like to attack America, Americans,again. There just is. That's the reality of the world. And I wish him all the very best." George W. Bush, Washington, D.C., Jan. 12, 2009. So I decided to help Mr.Bush on this case and designed a special cube for him to solve. This cube is white in color. Apparently Mr. Bush solved this puzzle in 25 minutes.People who have the IQ of Mr.Bush are requested to solve this puzzle and not to try the original Rubik's cube. In the mean time Mr.Bush wanted a slightly complicated puzzle to solve. So with the help of two scientists, I came up with a tougher upgrade of the beginner level exclusively for him. Now as we have made the less IQ people busy by giving them their much needed answer, we would proceed to find the solution for the original Rubik's cube puzzle. Let me not beat around the bush. So i am gonna give you the easiest way to solve the Rubik's puzzle. The solution is very complicated to explain. So I'd rather attach a picture of how to solve a Rubik's cube. LOL! Thanks a lot Chriz for sharing this! You made solving Rubik's cube look so simple. You're a genius I tell you..
Inspirational and comedy ya?? seringo... Do you know any of Bush's blogs? guess it wud explain abt the reason why it took an hour and then again 25 mins for the white cube! ha he ho...chumma adhuruthu ila! ...now for the ultimate question, "Who came first? the chicken or the egg?" please enlighten us on that one as well. serii saar, have u heard of rubik's sphere? Lol!! You are a genius! oh i loved Pursuit of Happiness fantastic movie! Nice info on the Rubik's cube. oh yes! i love pursuit of happiness! n i totally adore will msith!! i had another way of doing it, when i bout the cube it was proper ..but the coloured stickers started to come out and ultimately there were only whites all over ! I love The Pursuit of Happyness! I cry every time I watch that movie. It always inspires me to do better in life. I just need that white cube and a paint brush ...Damn !!! wow!! Swinging between philosophy and Humor..liked it...nice pics btw! Idhe pathi ezhudhadhe aale illenu nenaikren! Last year almost idhe time le, ennoda blog le I had written about the pursuit of happiness! i tried searching for the formula ...and got some results. but still couldn;t solve it. darn! Nice post . . . ..But its good to know how to solve the Rubix cube the right way .Its so simple just google out the simple algo's .It will take 2 days to learn and then be a pro showing off !!!!! For HP if you cant find out a simple algorithm for that just say it here I will have it for you. and yea,isnt bush the next einstein!!! I liked the movie too. me knows how to solve r rubiks cube...yay!!! GENIUS is the word for you. I can never ever forget this Chriz. Never can I thank you enough for letting me in on the secret. Now I can also solve the Rubik Cube. Thank You!!! ya ya! correct oly !!! rubiks cube is definitely the best thing to throw at people... you can run away and wreck others mind after that! I had actually painted the thing when I was a kid only to get kicked by my dear brother! Elders, i tell you! Million dollar solution and they just cant get the damn thing straight! ps: pursuit of happyness is b-e-a-u-t-i-f-u-l! I had actually thought u wud tell how to solve the cube.. umm...on second thoughts u did. And pursuit of happiness..awesome movie..brings tears! u r toooo good !!! And yeah Pursuit of Happyness..one of the best movie. Teaches life skills. Finally a very apt advice applicable to everybody. the most genius solution ever dude.. how did u think of it?? 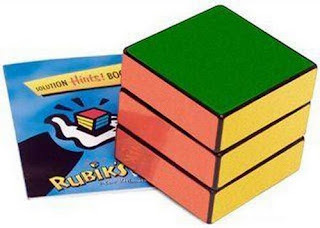 Hey, I have a Rubic's cube at home which I have been trying to solve for ages. Did not know the solution was that simple. Liked Will Smith and the pursuit of happyness. sigh! u got me again...the only post of urs that didn't make me laugh was abt Divya. i want Divya Bhabhi back for my own health !! Pearls of wisdom from your Alter Ego Mr. X. And rendu perum onna okkaandhu paatheengala? Epdi ipdi? lol. Beautiful film indeed is Pursuit of Happyness. Thanks for the FB request. Have accepted! haha so funny! i loved pursuit of happyness too.